Fat Tuesday or “Mardi Gras” is usually celebrated in European countries. This festival simply means eating all the meat and fats literally on the day before “Ash Wednesday” which is Tuesday… so they call it as Fat Tuesday. “Ash Wednesday” is the start of the Lenten Season that requires the practice of abstinence or avoiding meat consumption most especially among Catholics. 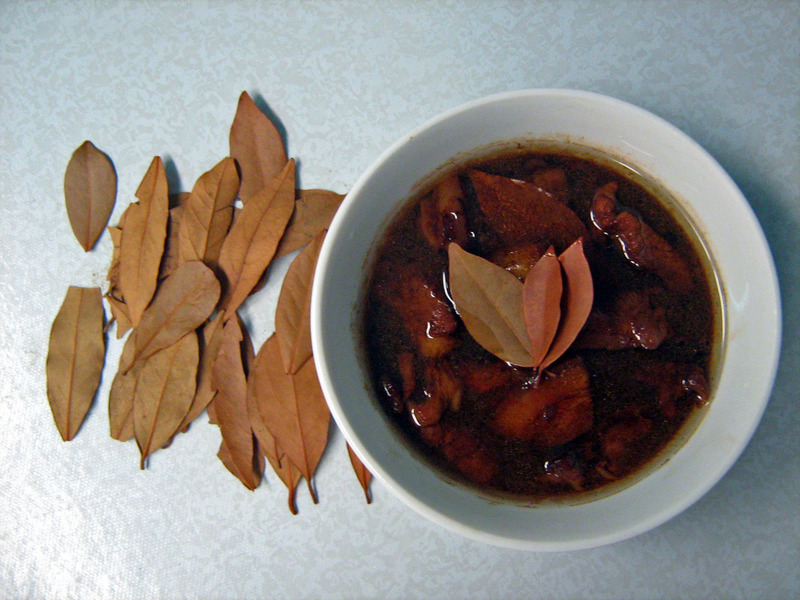 So, I have here my own simple version of “Adobo” which is “Dark Pork Adobo” for your “Mardi Gras” celebration. By the way, adobo or the Philippine Adobo is a popular Filipino cuisine that involves meat or seafood marinated in vinegar, garlic and sometimes with soy sauce in its cooking process. This dish is best for outings, picnics and campings as well for it wont spoil right away even without refrigeration. The long shelf-life of this viand is due to vinegar which inhibits bacteria growth in the food. Best when eaten with hot cooked rice. You will need: pork (sliced), vinegar, soy sauce, oyster sauce (optional), vegetable oil or cooking oil, garlic, ginger, onion, laurel leaf, salt or pork cubes and water. First, in a pot… cook pork in enough amount of water with slices of garlic, onion, ginger and a not too much soy sauce. Cook in medium fire. Let the water dries up as the meat absorbs all the flavors of the spices and the soy sauce. The meat then will produce its own oil. Keep on frying the pork in that oil ’til it tenders. But, avoid getting it burned. Remove the meat from heat and put it in a bowl. Now, this is where the real cooking of the “Dark Adobo” takes place. On another pot, heat a small amount of cooking or vegetable oil. Then, saute slices of garlic, onion and ginger in the oil. Afterwards, put the pork and fry it a little in the oil with the sauteed spices followed by putting enough amount of water. Let it boil for a while then add up soy sauce, oyster sauce and vinegar depending on your taste. Put the laurel leaf. Add a little salt to flavor or much better you can use any pork cubes to alternate with the salt. 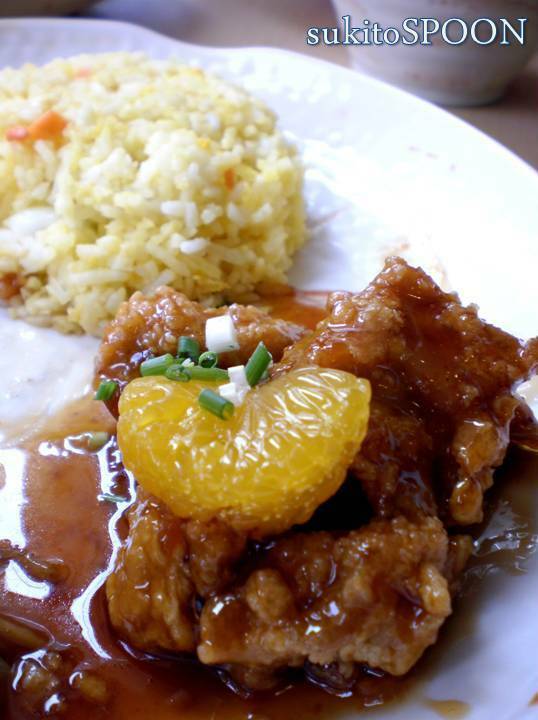 Simmer and serve hot in a bowl with a hot plate of rice. 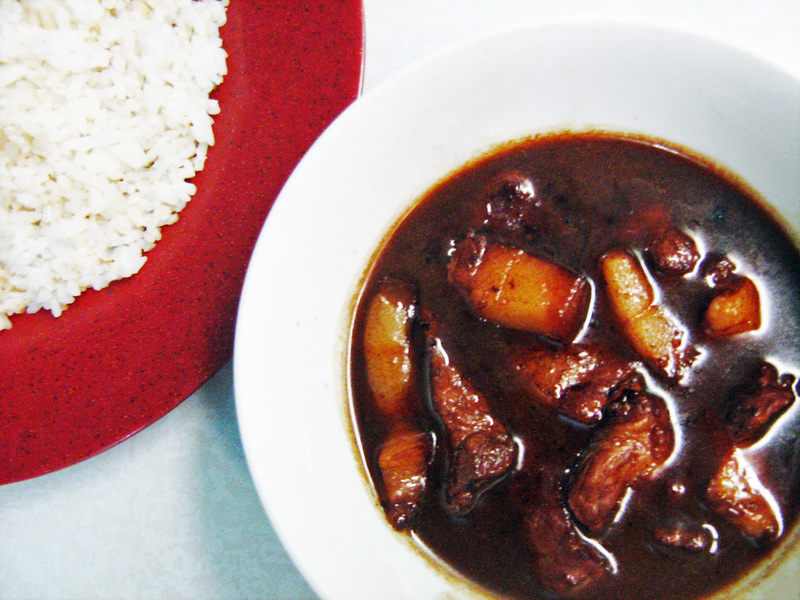 Have a cola or soda as your beverage to compliment with the slight saltiness of your “Dark Adobo”. Enjoy eating!